I can't quite figure out how to accomplish this. I have three or four devices that I want to block WiFi access to during a set schedule (say, overnight). I see the Block Services/Block Site option -- I'm looking to block a particular device completely. I think it can be done automatically but it would take a few steps to get it set up. First you would need to set up a range of IP addresses that you would use to schedule. If you are using the router as a DHCP server you would make this new range above the DHCP scope. You could check what range is set by going to Settings, Setup, Lan setup, and then looking at Starting and Ending IP address. For example if you are using 192.168.1.100 to 192.168.1.120, then your IP addresses you are going to use for your Parental controls would start at 192.168.1.121. In the same area under Address reservation you would start adding the devices you want to block by schedule. Then you would go to each of the devices and set up the same static IP that you assigned them in the last step. When you have all of the IP addresses added to devices you want to have parental control over, you click Apply at the bottom. Next you would go to Settings, Content filtering, Block Services, and change Services Blocking to Per Schedule. You would click Add, change Service Type to Any in the dropdown, change Filter Services For to IP address range, and enter the range of IP addresses you assigned static IPs to. For example if you started at 192.168.1.121 and added four devices to the static IP addresses you would put 192.168.1.121 to 192.168.1.125 and click Add at the bottom, and then click Apply at the next page. Next you would go to Settings, Content filtering, Schedule and set up when you want those IPs blocked from the internet. For example check Every day, uncheck All Day, set Start blocking at 23 hour 0 minutes and End Blocking to 07 hour and 0 Minute to block from 11PM at 7AM. Make sure the time zone is correct for you and click Apply at the bottom. I wish the firmware would come with a simpler way to do parental controls. My last router was an Asus router and they used a nice system where you can block each device and its own schedule. That way with different age children you can give the older kids a later time online than the younger kids. Other than the lack of Parental controls I really like this router OS, that would be the only thing I would add to it to make it complete. is Netduma any further with creating an decent app to work with this router ? Did your idea in their community section get much traction? I have not heard from them since I suggested it. Are you talking about the Nighthawk app? What else would you want it to do? No closer as it is by no means a priority, there is a lot to be done before then. Netgear will continue to make improvements to the Nighthawk app. Fraser , i gave up completely on Netgear . They're as useful as a chocolate fireguard! yeah their app. For example. 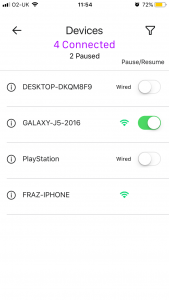 when my daughter is naughty and gets an internet ban , i want a quick way to open the app on my phone (LAN or WWW remote) and be able to bring up her device and hit BLOCK. 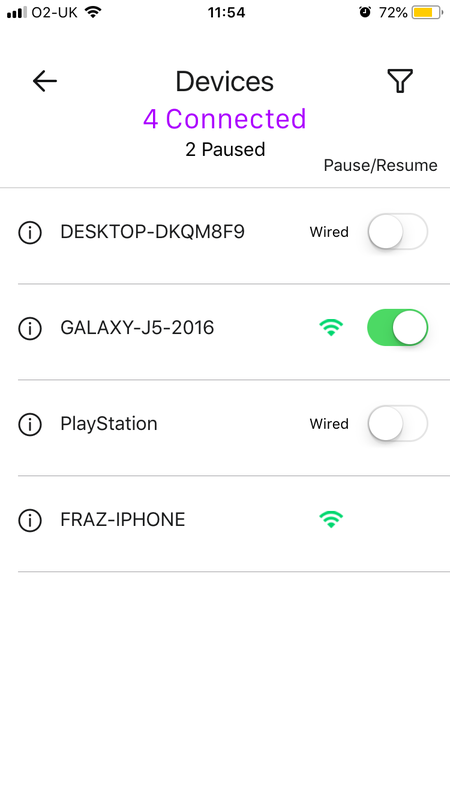 Currently the app only shows me "connected" devices and doesnt let me do anything other than look at them. it needs to show offline devices as well so they can be blocked for when they are next switched on. Otherwise the kids can just leave their device off for a while until i forget to do it on the App (as its not visible then) LOL! I think you're on an older version of the application then. I have an alpha version and you do have the ability to block/unblock (called pause/resume) the online devices. Doesn't show offline devices currently. So you will get that version of the app soon for what you want. im pretty sure im on the latest IOS version of the app, i keep my iphone updated daily with any new apps. i do see that heading on the Device List page, "Pause/Resume" , but tapping anywhere on the screen does nothing , other than the " (i) " which shows IP and MAc info. The filter button at the top right also functions. But i cannot pause/resume any listed devices....? I mean you're on the latest publicly available one but I have an alpha version which does enable me to block/unblock them. I'm sure that version will be available soon. lol, like i said earlier, useless app (at present) lol!! !